Ah Prom – An American Tradition. It has been one of the things that all three of our exchange students have looked forward to. 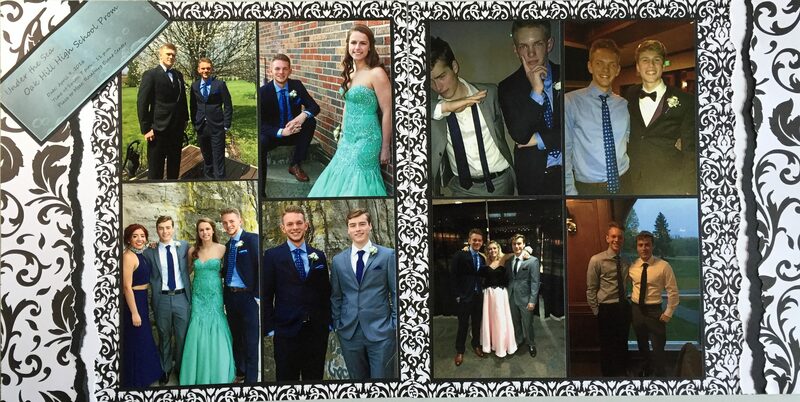 All of that to say is that I have gone through 4 prom seasons now and have scrapbooked all of them (See 2014 Prom). Part of my scrapbooking philosophy is that the pictures and ephemera is what is should be highlighted on the page, and so you will see that this spread has minimal embellishments – because I wanted to get as many pictures as possible onto the spread. I bordered the pictures and the prom ticket very thinly with a black border, and used a black and white background paper. To add interest to the page without taking away from the pictures, I created triple torn side edges using a larger print paper along with simple black and white papers. I used a jagged edge tearing tool to help keep the tears “even”.